Rosetta Clay was recently named assistant vice president of engagement at Illinois Wesleyan University. She made the transition from Menlo College to Illinois Wesleyan University, bringing with her a wealth of knowledge and experience in alumni relations. 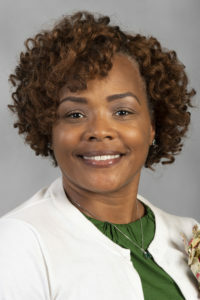 Rosetta Clay earned a bachelor’s in mass communications from Southern Illinois University Edwardsville (’94) and a master’s in marketing management from Johns Hopkins University Carey Business School. In 2005, she began working in alumni relations at the University of Maryland. Two years later, she became the director of alumni programs at Maryland’s Robert H. Smith School of Business where she restructured the school’s Alumni Chapter Board and created and launched a successful Regional Alumni Clubs program. From 2014-2016, Clay transitioned to North Carolina Agricultural and Technical State University, serving as the associate vice chancellor for alumni relations and executive director of the alumni association. While there, she led a rewrite of the alumni association’s strategic plan and developed a university-wide strategy for alumni engagement. Clay attributes much of her success on her career journey to experiences as an undergraduate at SIUE, “My time at SIUE was instrumental in learning how to communicate. I cherish my time there—what I learned and how my experiences really shaped me as a person.” She admits that while an undergraduate at the University, she had her mind originally set on becoming a newscaster, “It was through firsthand experiences that I found my true calling was actually in events and marketing” (Clay). She advises students to remain open and try many different things, “Do many internships, not just one, many” (Clay). Clay is driven by a great sense of commitment–to engage, inform, and educate people. Her new position as assistant vice president of engagement places great emphasis on these three areas and she is very enthusiastic about her new role at Illinois Wesleyan University.